Lavish historical scenery often appeared in Ferriss's fantasy drawings of the early twenties. In 1922, the year of the famed competition for the Chicago Tribune tower, the skyscraper was still pre-modern, at least in terms of style. Although he preached the prospect of a new architecture born of the zoning law in his 1922 New York Times article, Ferriss had no stance on what these new towers should look like, so, like most of architects of the period, he summoned historical precedents. Ferriss was less attracted to famous monuments like the Parthenon or Chartres than to vast architectural tableaux of the ancient civilizations of the Near East, Indochina, or Imperial Rome. A fascination with Babylon and other fallen civilizations was a popular theme among artists and writers in the early twentieth century, and the Tower of Babel was a common trope for setback skyscrapers, which were often referred to as modern ziggurats in the "New Babylon of New York." 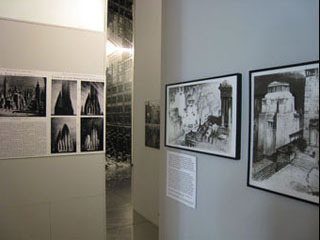 In these pen-and-ink drawings of 1922 and 1924, which are much closer to his earlier graphic style than to the dark charcoal renderings of the later twenties, Ferriss evokes a new cityscape of setback towers topped by expansive terraces, roof gardens, and a new urban elite who live in the sky.